A great neighborhood hang-out and wonderful find for foodies looking for something special. Especially if you failed to call well in advance for a reservation at Mustards Grill (the most famous of Cindy Pawlcyn‘s Napa Valley eateries)? Take solice. 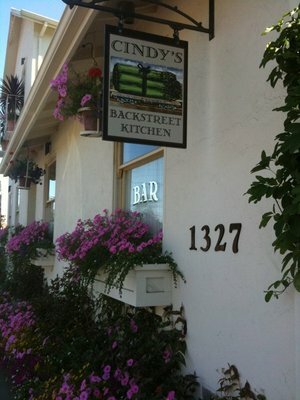 Just down the road is Cindy’s Backstreet Kitchen. Tucked behind Main Street St. Helena and as pretty as a postcard, sits a two-story house-like structure with flower boxes pressed against the many windows and a small, seasonal patio with wood-burning oven in a corner set back from the brick walkway leading to the front entrance of the restaurant. Charming. The interior is just as inviting. Almost like walking into a good friend’s home. Staff is welcoming and friendly. A long, well-stocked bar on the right; a few small tables behind, some along a wall with upholstered bench seating. The main dining room is in the back with additional seating up the stairs, along with a private room for small groups. Tables are set with crisp, white cloth and pretty, pastel-colored glass tumblers for water. Having eaten at Mustards, we were well acquainted with Chef Pawlcyn’s high standards and commitment to fresh, seasonal ingredients. So. What would this menu look like? Small and large plates, salads, sandwiches and sides are the order of things here. But with names like “Hail Caesar – Mighty Meatloaf – Adult Grilled Cheese – Achiote Roasted Pork Tacos – Wood Oven Duck and Rabbit Tostada” – a meal here promised to be a culinary adventure. Sometimes, we find sitting at the bar and talking to the bartender, manager or host is not only informative, but can be an enjoyable way to add to your experience. Especially when you are visiting for the first time. We often do this and, it seemed appropriate here. Besides, the place was fairly empty and the bartender looked lonely! After settling into our comfortable bar chairs and ordering the traditional New Year’s Day Bloody Mary (we like ours made the old-fashioned way, with Gin), we mentioned to the bartender that we had tried to first stop at Hog Island Oyster Bar in the Oxbow Market in Napa for champagne and oysters first, before lunch at Cindy’s. Alias they were closed. He told us the restaurant purchases their oysters from Hog Island and the kitchen makes a variation of Oysters Rockefeller. Hmmmmmmm. We prefer to eat our oysters raw. “No problem – let me check with the kitchen,” came the response from the bartender. Nice. Shortly, 6 lovely bi-valves were set before us, which we eagerly polished off. Next, I ordered one of the special starters, Smoked Salmon on a Buckwheat Blini, with a sour cream and chive sauce. Hubby decided the Prime Rib Sandwich on house made soft roll with bleu cheese and “Killer Fries” (as our new best friend, Bill the Bartender described them) was his ticket. The Smoked Salmon dish looked wonderful and tasted better. Fresh, light and flavorful. The Prime Rib Sando was equally good with melted bleu cheese oozing from beneath semi-thin slices of prime rib. And the fries were indeed killer. Next up for me, the Stuffed Piquillo Peppers, with cumin braised beef and charred tomato salsa. This dish was incredibly good. 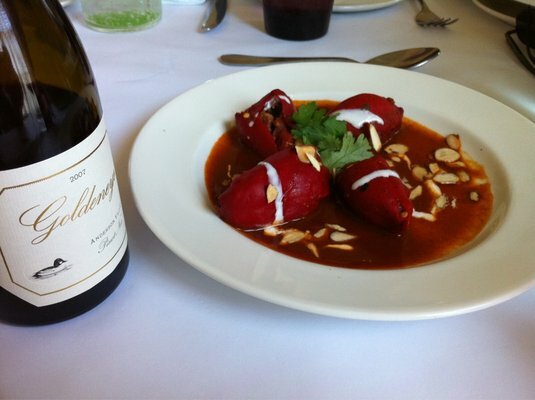 Piquillo peppers are sweet and mild and the tomato salsa was more of a puree with a deep, rich mahogany color and a bit of a spicy kick that lingered on the palate after each forkful. Definitely bread dipping worthy. I was also told by “Bill the Bartender” that this dish had quite a loyal following with the locals. Sign me up. Dessert? Of course! I asked for the house speciality, and was told the Warm Pineapple Upside Down Cake with rum-caramel & pecan topping and served with house made vanilla ice cream was a favorite. 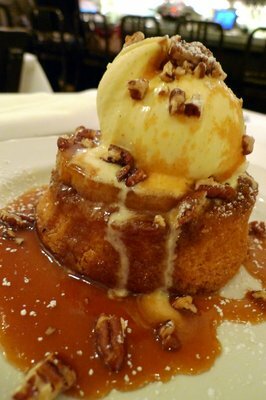 Such an old-fashioned desert, and one my mother was famous for at family dinners. This version was a step up or two from Mom’s and oh-so gooey good. Another winner on my scorecard for this place and kudos for making their own ice cream. Such a homey touch that unfortunately few restaurants provide and it’s really such a simple task to make ice cream these days. Not a cheap meal if you go for more than a starter, but worth the price you will pay to sample food by a world-renowned chef and pioneer in the development of Wine Country cuisine. Get Thee to Cindy’s Backstreet Kitchen and discover again why Northern California remains the mecca for farm-to-table cooking. Wine notes: Good selections of local wineries without offering the kitchen sink! Decent by-the-glass pours too. Loved reading your blog. Glad you had a great time! Thank you for reading and, starting our 2012 out on a high note with your food!